I had started to think of CAVM as a value stock (see prior article here), but with the QLGC acquisition announced, there are a few more questions to think about. It is easy to see why investors did not like the acquisition (CAVM closed down 18% day after the announcement) – clear threat of revenue deceleration AND gross margin compression. That’s a deadly combination for a stock that has consistently traded at premium valuations. 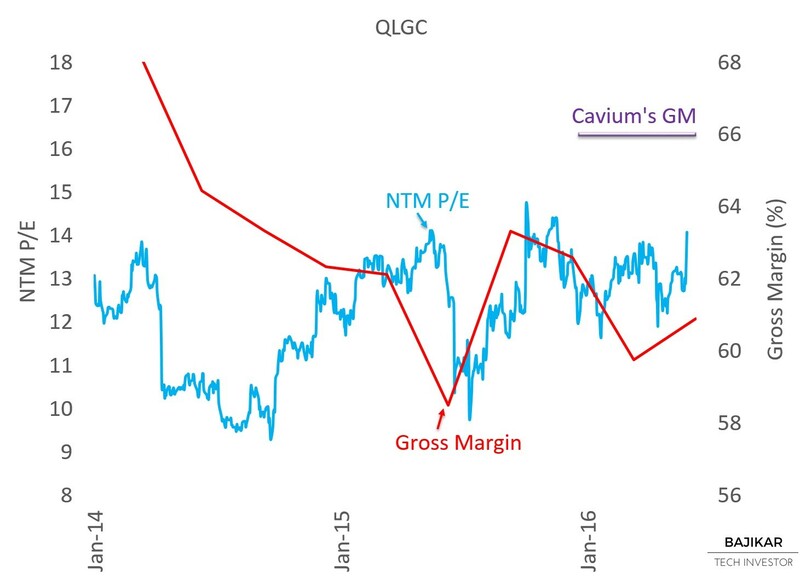 Also, looking at the charts below, Cavium does not appear to be acquiring QLGC at a significant discount. Management’s commentary and guidance were both conveniently dismissed (because as usual, investors “know” better). The question is whether to buy the stock here, or leave it for dead. Within my 4SAFEt framework, looking beyond lingering uneasiness about valuation, the real catalyst here would be the likelihood of inflection in company fundamentals. Building conviction around such inflection will not be easy – it never is. 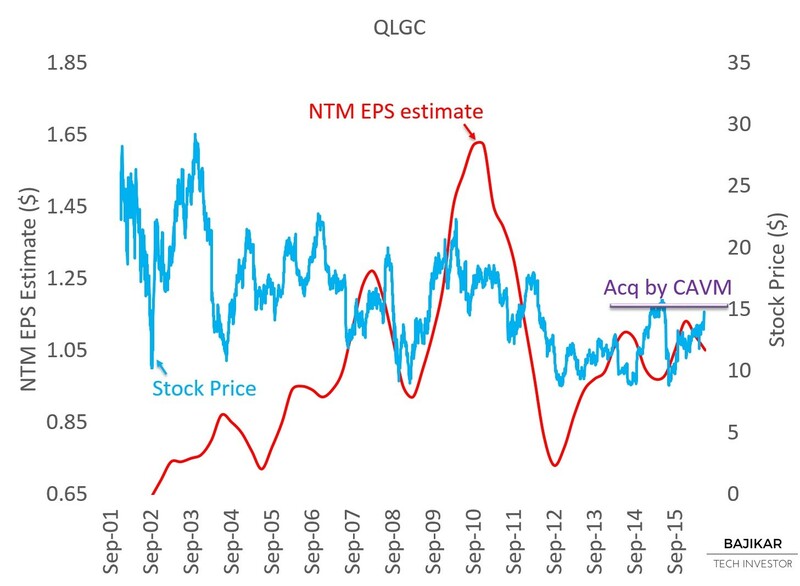 The chart suggests that QLGC was probably fairly valued at $15.50 (or lower). This means Cavium did not pay a significant discount for the acquisition. 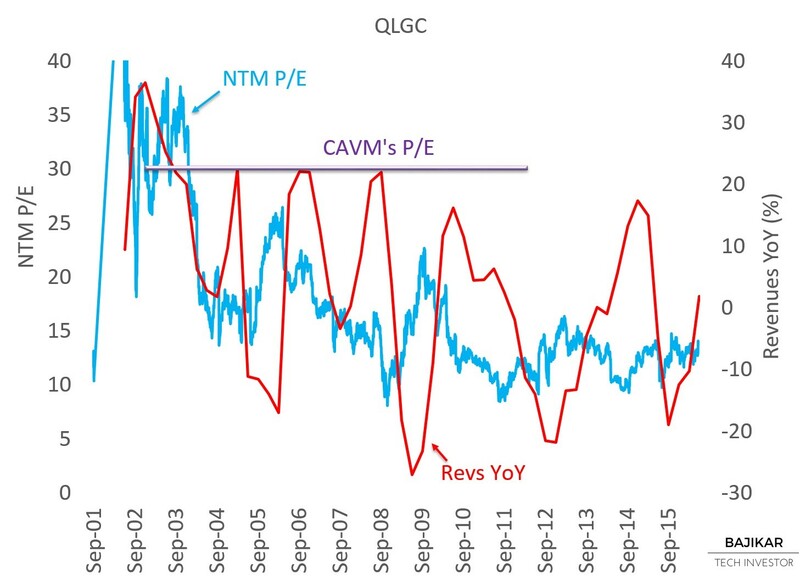 The next chart illustrates the spread between CAVM’s ~30x P/E multiple and QLGC’s ~12x. The chart also shows that QLGC had not really been growing revenues for a while. Finally, the chart below shows the spread between Cavium’s ~66% gross margins and Qlogic’s ~60-64%. This framework again suggests that QLGC was not trading at a significant discount on a P/E basis. 1. After offloading the “legacy” business, what would be the growth trajectory of the remaining elements – primarily Fiber Channel connectivity, and Ethernet Adapter? Qlogic’s legacy business represented ~10% of revenues, and has been declining at ~30% per year. Of the remainder, Fiber Channel (majority of the “core” business) is hardly a growth business, even after optimistic assumptions around Flash arrays (maybe ~30% of the business). That leaves much hope to be hanged around the Ethernet business (~30% of core), which carries lower margins. 2. Can Cavium restructure the Ethernet business to raise its gross margin profile from ~30% to something higher, perhaps in the ~50% range? This is something that Qlogic was not able to accomplish on its own, perhaps due to lack of adequate investments, or other issues with the cost structure. Cavium guided the combined entity to grow revenues at double digits, at “Qlogic Core” gross margins in the 64-66% range and “Qlogic Core” operating margins in the 30-35% range, exiting 2017; and for Qlogic’s net income to contribute $0.60 to $0.70 of non-GAAP EPS in 2017. Looking at Qlogic’s standalone net income over the last two years, Cavium’s EPS contribution guidance does not seem that far fetched, after factoring in expected synergies ($45m by end of 2017). Still, management seems to have set itself up for a difficult job, one that may require investors to “wait and see”, which usually means investors will take the liberty to second guess everything Cavium says from here, until it has satisfactorily delivered multiple beats and raises, after closing the acquisition. This means buying the stock here basically involves making a longer-term bet on Cavium’s execution, an area the company has historically been exceptionally strong at. Disclosure: As of this writing the acteve Model Portfolio held a long position in CAVM, but no position in QLGC.